Foreign-trained doctors, nurses and medical technicians may help fill the gap between the number of health care professionals working in the United States today and the larger number expected to be needed when the federal Affordable Care Act goes into effect on January 1, 2014. Welcome Back Centers at Grossmont College and eight other locations around the United States help to coordinate local efforts to prepare the foreign medical professionals for their American licensing examinations. As project manager of Grossmont College’s Welcome Back Center, Gail Patterson, PhD., counsels the health care professionals about what they will have to do in the United States to resume the careers that they had to give up when they immigrated here. Almost before they do anything else, she said, many health care professionals need to improve their ability to communicate in English. To do that, they can take courses in English as a Second Language (ESL) and Vocational English as a Second Language (VESL) in which they learn English-language medical terminology. Improved English skills also helps the medical professionals do better on the written examinations they must take to qualify for licenses here, Patterson noted in an interview. For those with a knack for sales interested in joining the emerging green workforce, Cuyamaca College is offering a free course on selling solar energy systems. The class will meet from 8 a.m.-5 p.m. Aug. 5, 6, 7 and 9 and from 1-5 p.m. Aug. 8 at Cuyamaca College and will provide the skills and knowledge to sell solar photovoltaic energy systems, including information on the latest financing and incentive programs. Additionally, students will gain the basic technical know-how to design residential and small commercial systems to best advise potential clients. They will also become familiar with industry tools for performing calculations on return on investment, cost analysis and sales proposals. Holocaust survivors Max and Rose Schindler related to a group of incoming freshmen at Grossmont College on Monday, July 22, that after enduring such horrors as the death of family members, near starvation, and constant humiliation at the hands of the Nazis, they finally were liberated from separate Nazi concentration camps in 1945, when they were still younger than the students in their audience are today. Now both in their 80s, the Schindlers were not yet 16 when Russian troops liberated the former Rose Schwartz of Seredne, Czechoslovakia, and Max Schindler of Cottbus, Germany. Students in the Grossmont College audience, who had read Night by Elie Wiesel as part of their Summer Institute Program and will be traveling this week to the Museum of Tolerance in Los Angeles, crowded around the couple to see the numbered tattoo that Rose had received at Auschwitz and the KL (for Konzentrationslager, or “Concentration Camp.”) that had been tattooed on Max’s arm. Rose said that when the tattoo was administered to her, two people had to hold her down, because she fought so hard against it. She said it was very painful. A contract with the San Diego County Sheriff’s Department to provide law enforcement for the Grossmont and Cuyamaca college campuses has been unanimously approved by the Grossmont-Cuyamaca Community College District Governing Board. The Governing Board ratified the $1.4 million contract with the Sheriff’s Department Tuesday night to take over the police functions now provided by the district’s Public Safety Department. Sheriff’s deputies will begin their duties at the two East County college campuses on August 19. Look! Up in the sky! It's an exhaust fan! A malfunctioning exhaust fan on the roof of Grossmont College’s science building was replaced by flying in a new unit via helicopter. 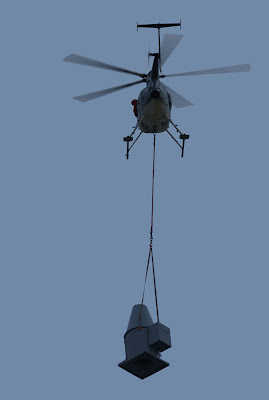 Four new components were attached to the helicopter, which used the parking lot north of the science building as its staging area, and dropped onto the roof for installation in four trips. The work took approximately 20 minutes to complete. Sheriff’s deputies and officers from other law enforcement agencies around San Diego County practiced at Grossmont College on Tuesday what they would do in the event of an emergency situation on the campus. As news media and college officials watched, the deputies practiced what they would do in an active shooter situation, how they would respond if students were taken hostage, and what measures they would take if an officer were wounded and on the ground. The three scenarios unfolded one right after another, simulating the confusion and tumult that might occur if the horrible situations had been real. Grossmont College students had been alerted in advance to not be alarmed by the law enforcement drill, and also to keep their distance so as not to interfere with it. In the simulation, teenagers from the sheriff’s Explorer’s unit played the role of frightened students who suddenly were confronted by a gunman in their classroom. The drills began shortly after 2 p.m. when a deputy involved in the scenario began firing blank rounds from a mock firearm. Alerted to the gunman’s whereabouts, a team of deputies in protective formation advanced toward the gunman, who fled. The deputies followed and confronted him. The Grossmont-Cuyamaca Community College District is gearing up work on the Proposition V bond program, with selection of a program manager and preparations for the first round of bond sales next month. The $398 million Proposition V bond measure was passed by East County voters in November 2012 to provide capital improvements, renovations, repairs and upgrades on the district’s two campuses, Grossmont College and Cuyamaca College. Proposition V was the result of a comprehensive planning process, which culminated in a master plan identifying extensive facility needs, retrofitting and infrastructure upgrades. The 2013 Facilities Master Plan, adopted in March 2013, defines Proposition V efforts and builds upon work that began with the $207 million Proposition R approved by voters in 2002. Along with $68 million in state matching funds, Proposition R constructed or renovated 13 major projects on the two campuses. Work on those projects will near completion this fall. A bond sale for Proposition V is scheduled for August 2013. The Grossmont-Cuyamaca Community College District is negotiating a contract with the San Diego County Sheriff’s Department to provide police services at Grossmont and Cuyamaca colleges, a move that will improve coverage on the two East County campuses and provide access to the department’s specialized units. The contract is expected to be brought to the district’s Governing Board when it meets at 6:30 p.m. July 23 at the Cuyamaca College Student Center. If approved, a sheriff’s sergeant will be stationed at the district, along with a team of deputies dedicated to each of the two campuses. Additional assistance will be provided by other sheriff’s deputies and specialists as needed. Picture Schroeder hunched over his toy piano, playing Beethoven’s Ninth and you have a pretty accurate image of jazz pianist Chase Morrin as an 8-year-old teaching himself how to compose music on the toy keyboard he got from his parents for Christmas. A little more than a decade and numerous music awards later, Morrin is now home from college for the summer and will be performing 7:30 p.m. Wednesday, July 10, at Cuyamaca College. Now 19, the former child prodigy is an accomplished musician, composer and band leader, and has gone on to win prestigious accolades, including four ASCAP Young Jazz Composer awards, the 2013 Artist Development Fellowship from Harvard and his 2011 selection as the pianist of the Monterey Jazz Festival’s Next Generation Jazz Orchestra. Last December, he performed at Lincoln Center, where he received the ASCAP Henry Van Heusen award recognizing promising composers. The day before she was to meet the Grossmont College search committee that would interview her for the job as vice president for academic affairs, Dr. Katrina VanderWoude, vice provost at Rochester College in Michigan, decided to do some interviewing of her own. Visiting the Grossmont College campus incognito, she struck up conversations with students over lunch in Griffin Center, and elsewhere on the campus, to see if she could get a feel for the place at which she later accepted the job. "I'm big on cultural diversity of all types, and what I was intrigued by most was that nobody asked me if I was somebody's mother," Dr. VanderWoude recalled in a telephone interview from Michigan. "That told me that Grossmont College is used to a diverse student population. It was assumed that I was there as a potential student, and in fact students were telling me who I needed to talk to, and I was really appreciative of that. I was very impressed by the openness of the students."